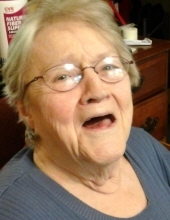 Edna Ruth Wheeler Atkins, known to many as MamaRuth, passed away peacefully in her sleep on Friday, March 22, 2019 at the age of 93. A long-time resident of Durham, NC, Ruth lived the final decade of her life being tenderly cared for in her daughter Karen’s Burlington home. Born on July 29, 1925 in Crittenden County, Kentucky, she was the only daughter of George Elliot Wheeler and Nellie Pearl Wheeler. She survived all six of her brothers: RL, Carl, Harold, Paul, Lonnie, and Daniel (Danny). Always musical, young Ruth regularly played guitar and spoons live on a radio show in Kentucky. During World War II, she was a real life “Ruthie the Riveter,” working on the assembly line at an airplane factory. Throughout the war, she exchanged letters with her sweetheart, Josiah Alton Atkins (Joe). In 1946, she moved to North Carolina and married Joe. They shared a life for 49 years until his passing in 1992. Together they raised two children, Kenneth Alton Atkins (Ken), born in 1947, and Karen Anne Atkins, born in 1952, in a house that they built from scratch on Atkins family land on Hope Valley Road in Durham. She is predeceased by her parents, her brothers, her husband, and many of her treasured friends and in-laws. She is survived by her children, Ken (Beth) and Karen Atkins, her grandchildren Tony (Elaine), Kendra (Steve), and Sam (Ashley), and her cherished niece Georgean “Geana” Ruth (Anthony). She also leaves behind three great grandchildren, Karys, Phillip, and Saryn Ruth, two special great-nieces, Jessica and Natalya, and one special great-nephew, Kevin. She is remembered fondly by numerous other family members and friends. A graveside funeral service, officiated by Ruth’s son the Rev. Dr. Kenneth Atkins, will be held 11 a.m. on Monday, March 25 at Woodlawn Memorial Park mausoleum. The family will receive friends from 6 to 8 pm on Sunday, March 24 at Clements Funeral Home, Durham. The family would like to offer thanks to special caretakers Johnnie May Fields and her daughter Ruth as well as Amedisys Home Health and Amedisys Hospice for their loving care in Ruth’s final years. Ruth would not consider her death to be a tragedy but rather a reunion with her husband Joe, her savior Jesus Christ, and the other loved ones who went before her. To send flowers or a remembrance gift to the family of Edna Ruth Atkins, please visit our Tribute Store. "Email Address" would like to share the life celebration of Edna Ruth Atkins. Click on the "link" to go to share a favorite memory or leave a condolence message for the family.